Industrial Dock Light Supply is dedicated to providing a wide variety of warehouse dock lights arms, heads, and signals for use in and around industrial applications. 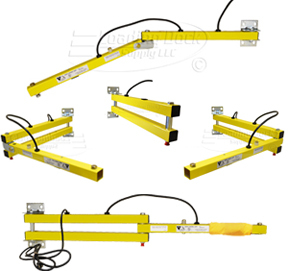 Industrial dock Light supply's Loading Dock lights are offered in an assortment of light head styles and arm lengths, whether assembled or unassembled, we work to to suit your needs. We also offer a wide assortment of warning lights which are flashing, rotating and strobe in addition to warning devices such as back-up alarms and sirens. Often found on fork lifts, emergency vehicles, buildings, and entertainment venues Loading Dock products are truly versatile in their application. to talk with one of our knowledgable sales representatives. Industrial Stop and Go Lights, Traffic Lights, warehouse signals, and Stop Lights can be ordered in a variety of configurations and housing colors. Increasing safety on your dock through effective communication signals truck drivers and fork lift operators interact more efficiently. Upgrade your exisisting units to LED lenses and receive the added bonus of a three year lens warranty and lower maintenance costs associated with older modeled Incandescent traffic lights. Industrial Warning Lights are used for warning applications;lighting effects or as a machine status indicator. Choose from Strobe Lights, Rotating Lights, or Flashing Lights. The traditional incandescent light head is a standard in the dock light industry proven to be an affordable, tough, long lasting investment for your Loading dock or work area. The HD LED dock Light head uses up to 97% less energy than the traditional 300 Watt Incalescent Light Head, Coupled with a durable cast aluminum housing the Heavy Duty LED Dock Light Is suitable for most any situation. Rated for use in wet, cold, and hot environs the HDLED dock light will suit most applications. Units are expected to deliver more than 90% lumen maintenance for over 10 years in typical applications and environments. That’s usually more than a 60,000 hour life expectancy. The innovative polycarbonate light head housing is an attractive piece of hardware built to be tougher than its metal predecessor. With a High Pressure Sodium Light you will get one of the most energy efficient dock light heads on the market. Energy saving products for USA Warehouse lighting applications.